In microfluidic systems in biological applications, gas bubble injection into the microfluidic device presents an important potentially complicating issue because bubbles can attenuate the system efficiency and disrupt the viability of the biological sample. This Letter describes the removal of air bubbles from a microfluidic stream using a negative optical gradient force. The device comprised two parts, used for air bubble generation (region A) or separation (region B). As the air and liquid (DPBS in this study) met at the T-junction, spherical air bubbles were generated via break-up. In the absence of laser illumination, a single force acted on the bubbles, the viscous drag force, and the bubbles tended to exit along the lower outlet (outlet 2). In the presence of laser illumination, on the other hand, the bubbles were deflected to the upper region of the channel due to the negative optical gradient force. The air bubbles were then removed from the main flow stream. A continuous wave neodymium-doped yttrium aluminum garnet (Nd:YAG; wavelength k¼532 nm) laser was used to apply a Gaussian-shaped illumination beam. 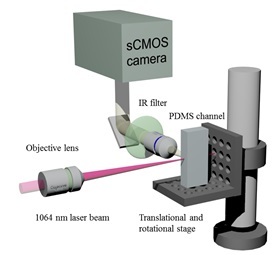 A 16-bit high-speed complementary metal oxide semiconductor (CMOS) camera (pco. 1200 hs, PCO, USA) and a white light-emitting diode collimator source(LED; cool white 5500 K; Mightex, USA) were used for visualization. 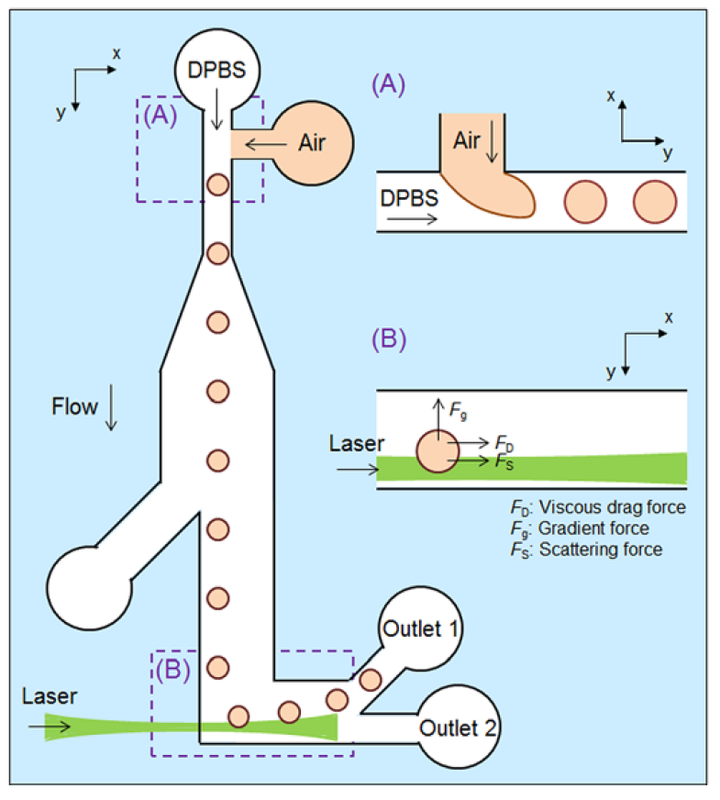 An approximately165 lm thick microfluidic channel was fabricated using a conventional soft lithography process, and a facet smoothing technique was employed to avoid laser beam scattering at the interface between the PDMS channel and the surrounding air.19The flow rates of filtered air and DPBS (Sigma-Aldrich) containing 2 wt.% Tween 20 were gently adjusted using a commercial syringe pump (Nemesys Centoni, GmbH, Germany). The characteristics of the air bubble generation process using the T-junction geometry (region A in Fig. 1). Bubble generation using the T-junction method. The air flow rate was fixed at 20 ll/h whereas the DPBS flow rate was adjusted over the range 2500–4500 ll/h: (a)–(e) show the air bubbles generated at air flow rates of 2500, 3000, 3500, 4000, and 4500 ll/h, respectively. (f) Bubble size as a function of the DPBS flow rate. The debubbling characteristics of the system under bubble removal conditions (the removal region B in Fig. 1). As shown in (a), in the absence of the laser beam, air bubbles 133 lm in diameter formed along one sidewall and slipped out through outlet 2. 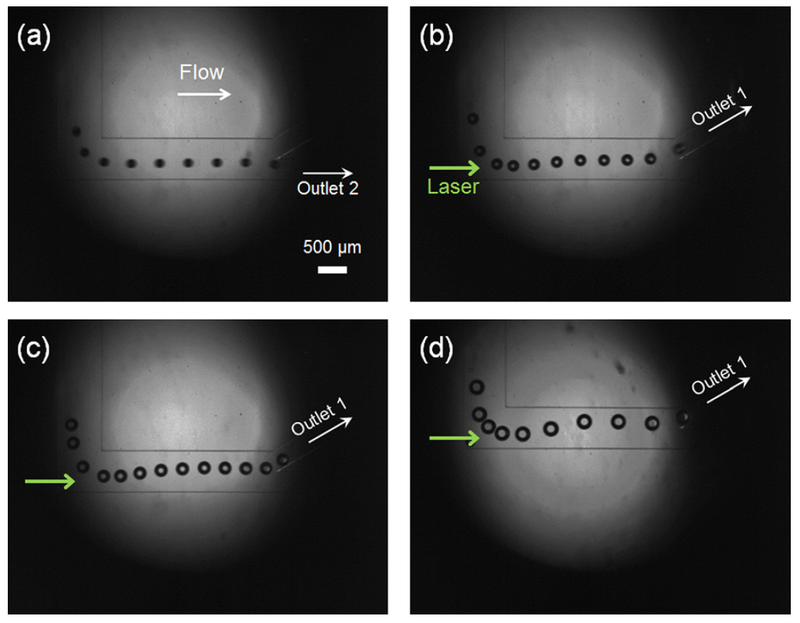 Application of the laser beam to the bubbles in the channel, on the other hand, exerted a negative optical gradient force that forced the bubbles toward the opposite sidewall. (b) shows the trajectory of a 168 lm air bubble traveling at a flow velocity of 1.70 mm/s. The bubble drifted from the initial streamline due to the negative optical gradient force and exited outlet 1. As the bubble diameter increased, the displacement distance in the vertical direction (i.e., y-direction) increased accordingly. The debubbling system described here is expected to facilitate the processing of solutions containing biological cells by removing bubbles. 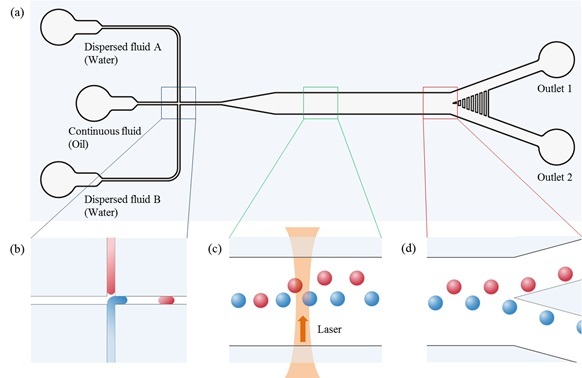 Cells would not be removed from the flow along with the bubbles because unlike bubbles, cells would be attracted to the laser beam axis due to the positive optical gradient force. 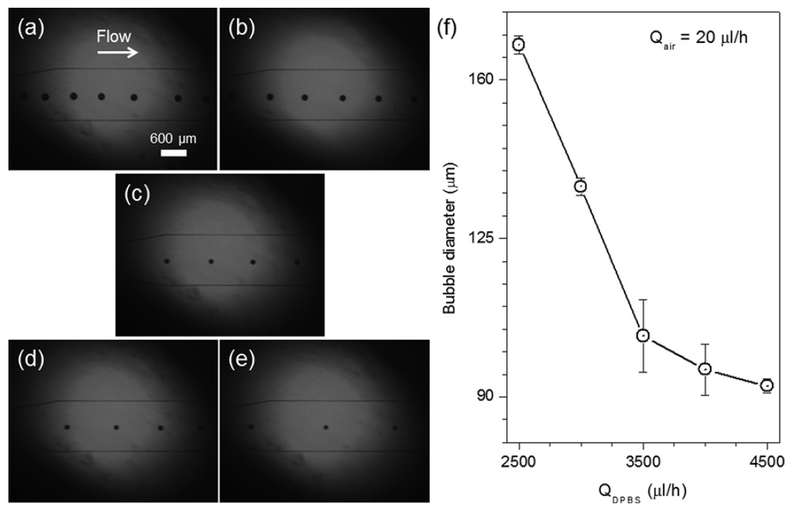 The behavior of the droplets was characterized in terms of the optical force and the hydrodynamic effects present upon illumination of the droplets in a direction normal to the flow direction in a rectangular microfluidic channel. (a) Schematic illustration of the PDMS microfluidic device used to generate two species of droplets. The device successfully separated the droplets at the outlets. (b) Generation of droplets at the T-junction. (c) Optical manipulation of the droplets. (d) The illumination conditions induced the label-free droplet separation at the y-shaped bifurcation. The experimental setup used to optically manipulate the droplets. A 1064 nm CW laser was used as the light source. The objective lenses positioned the focal point at a test section in the PDMS device. A syringe pump was used to prepare the fluid flow in the microfluidic channel. Because the alignment between the droplet and the light can significantly affect the results, the sample was carefully adjusted using a translational and rotational stage. Experimental data were captured using a sCMOS camera (Andor Corp.) through an IR filter that prevented the scattered illumination light from damaging the detector array. Optical switching was used to manipulate the droplets. The droplets contained a 6M CaCl2 deuterium oxide (D2O, Sigma Aldrich) solution, and the continuous phase fluid was HFE-7500. The velocity of the continuous fluid was 900 μm/s. (a) When the laser was off, all droplets flowed to the waste branch (downward). (b) Under illumination, the droplets were deflected and moved toward the upper outlet. 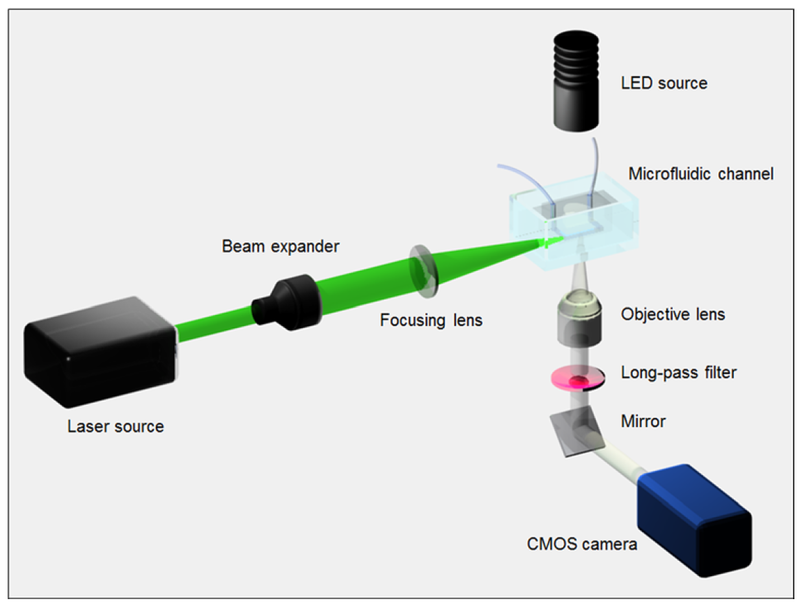 The laser beam was used to manipulate the droplet trajectories from the left-hand side of the image, outside of the field of view. The droplets displayed different behaviors, depending on the refractive index contrast between the oil and the water phases, even under identical conditions. Droplet A contained a 6M CaCl2 deuterium oxide (D2O, Sigma Aldrich) solution and droplet B contained deuterium oxide (D2O, Sigma Aldrich). As the CaCl2 concentration increased, the refractive index increased. Droplet A had a higher refractive index contrast and was deflected by the illumination beam to a larger extent than droplet B. As a result, droplet A was deflected along the direction normal to the flow. The velocity of the continuous fluid was 900 μm/s. Droplet B was screened using optical force separation techniques. The carrier fluid flowed from left to right and the illumination beam was focused at the center of the microfluidic channel in the z-direction. The velocity of the continuous fluid was 900 μm/s. (a) Droplet A entered the test section and was illuminated by the laser beam. The bright spot of the droplet focused the light beam due to the high refractive index of the droplet A. (b) Droplet B followed along the same streamline and entered the illumination beam. Because the refractive index of droplet B was similar to that of the carrier fluid, the light did not deflect the path of droplet B. (c) The trajectories of droplets A and B are shown. Only droplet A was deflected laterally from its original trajectory within the streamline.